Pommes Dauphinoise to the French; pomme dauph, pots dauph, pots DORF or porpoise potatoes in this kitchen (Dolphinoise, y'see? ), is one of those simple dishes that is much more delicious than the ingredients allow. Sliced potatoes, in cream, well seasoned with sea salt and just a hint of garlic. Both my boys relish the leftovers. They look over mournfully at the table if a guest takes the last scrapings; the final golden, crusty bits on the edge of the bowl. Like Yorkshires, this is a golden carb dish that always elicits an 'ooooh' at the table. It goes exceptionally well with our short rib of beef but works also with fish. It's a simple dish and recipes abound, however, I do mine slightly differently; in part prompted by supper club vicissitudes. 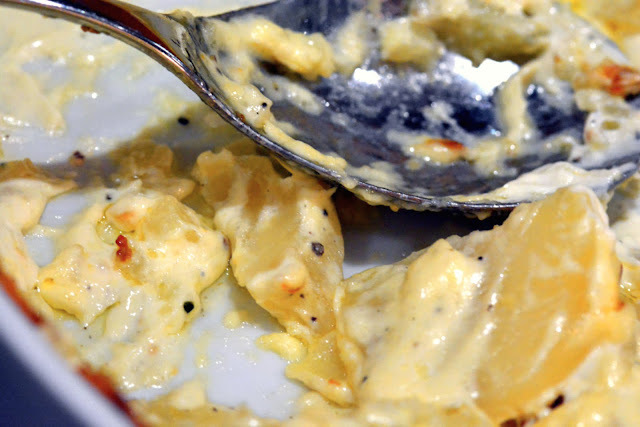 Dauphinoise take a good 20 minutes to prep and at least an hour to cook. But, I can't have my ovens taken up just before service nor can I accurately know when service will be. Guests have been known to be forty five minutes late. My spuds in cream would be milky mash by then. I needed my pommes to be dauphinoised ahead of time. I also wanted to find a way to cook the potatoes that didn't result in the serving bowls crusted with burnt creamy dribble. in the oven, the cream bubbles and spits and makes a right mess generally. We're pretty informal in the restaurant but I don't want crockery that looks like it was in a bar brawl... and lost. You'll need just over a kilo of potatoes for four people. I always use floury Maris Pipers. They are the least 'wet' potato and keep their shape and texture. I know some advocate a waxy spud but I can't be doing with that; all kinds of wrong. Firstly, butter well an ovenproof dish or tin. Then crush in a garlic clove and squish it all around, ensuring no big startling lumps. Peel and slice your potatoes. The thickness is important, as is consistency. I go for 3mm - like a pound coin (apols to non UK readers). I use a mandolin; this makes the task much quicker but it is certainly possible with a sharp knife. By the way. You know that deep fried potato peelings make a very decent bar snack yeah? By 'decent' I mean tasty not healthy of course. Ahem. Layer up the slices in the dish, pressing down occasionally. In a jug mix approx 300ml of double cream with 500ml of full fat milk. Do use the full fat. Skimmed milk is just white water. If you're worried about calories, eat less. Mind, if you're worried about calories, what are you doing reading a Pom Dauph recipe? Season the milk well with salt and a dab of black pepper. Taste. It should be salty. Remember this is the only seasoning in the dish. I find this more successful that salting the slices as you go. It's easy to forget a layer and potatoes, like all savoury, starchy dishes, really need salt. Pour the milk over the potato slices, just covering the slices but not so close to the dish top that it'll boil over. You may have some left over, you may need a little more milk. Finally, a few dabs of butter on top. I'm making enough here for a table of ten - plus some second helpings. I now place the dish on a baking tray/sheet and cover with another, making a sandwich that's easy to handle, and cook for about 70 minutes at 150°C. This results in a dish of par-cooked, yielding potatoes, still pallid like a Scotsman in February, and needing a further blast of big heat. You should be able to push in a table knife without much resistance. Else, do another ten minutes. Actually I often use the oven timer and just leave the dish in the oven when it turns itself off. Otherwise, take the dish out and keep until guests arrive. You can do this even a day in advance - but in this case, place in the fridge. Pots Dauph, all snug in their metal duvet. Once guests are in place, crank up the oven to 230°C, remove the top tray and blast the potatoes for around 20 mins until golden and bubbling. If it's 30 minutes I doubt anyone will complain. A fan oven will help with the browning. I will often cook the potatoes while a joint of meat is resting, using the still hot oven. Serving at the table can be an issue as the dish is very hot. We use some small wooden boards underneath to make handling easy but I imagine a tea towel would be fine for a family meal.